Though I don't often buy dried fruit, I have always enjoyed snacking on it or using it in my baking. My dad has always had several jars full of dates, fried figs and dried apricots so (though I don't always abide by it) I've long been programmed to think of dried fruit as a healthy snack. Goji berries have been championed as a superfruit. They are high in antioxidants, vitamin A and some studies have shown that they promote mental wellbeing and happiness. nu3 sent me some goji berries to try out in a recipe, and of course I chose an unhealthy recipe just so that we balance out the goodness. I've only tried goji berries in packs of mixed dried fruit so wasn't too familiar with their flavour. They are sweet, as you would expect from dried fruit, and taste almost smoky. I know that's an odd description for a fruit, but it's the best adjective I can find. They remind me a bit of concentrated cranberries. Pretty much everything goes with chocolate, so I threw the berries and some white chocolate into cookie dough, et voilà. The cookies taste really good. The white chocolate works pretty well with the goji berries, which add a nice chewy consistency to the cookies. I reckon dark chocolate would work well here as well, and the goji berries could also be exchanged for another dried fruit. The possibilities are endless! Preheat the oven to 200C/180C fan; line two baking trays with baking parchment. Beat the caster sugar and butter together until well combined. Beat in the egg until the batter is smooth. Chop the chocolate into chunks and stir into the dough, followed by the goji berries. Ensure that the berries and chocolate are well distributed. Use a tablespoon to scoop the dough onto the baking trays, spacing the scoops a couple of inches/a few centimetres apart to allow them to spread. Bake the cookies for 15 minutes. They might still look a little bit soft, but they will continue to cook when you take them out of the oven so it's not necessary to let them brown completely. Let the cookies cool on the baking trays. I'm entering these cookies into The Biscuit Barrel Challenge, which is run by the very talented Laura at I'd Much Rather Bake Than... (a fellow chemistry enthusiast). This month's theme is chocolate. I was sent a sample pack of goji berries by nu3 as an incentive to enter a competition that they are holding amongst British bloggers. All opinions are my own. I've not tried goji berries either, but love most dried fruit so should really give them a whirl. Your cookies look great - I do like white chocolate in a bake! I've wondered for ages what goji berries taste like but was worried I wouldn't like them. They sound like they go perfectly in these cookies though, especially with the sweetness of the white chocolate. 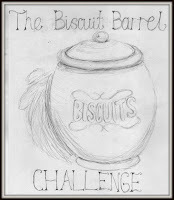 Thanks for sharing them with the Biscuit Barrel challenge!